Ask anything about this gadget on the official gadget thread on the Bitcoin forum. Read usage instructions or advanced usage tips. Sign up to be notified about gadget updates. As of 14th February 2019, third-party service that is used for fiat exchange rate (target currency field) has changed licensing terms. Please download updated gadget if you're using target currency field and create target currency API key. MyBitcoins is a Windows gadget (Vista sidebar or Windows 7) which displays two values: the amount of bitcoins you have, and an estimated value of those bitcoins in your preferred currency. Accepts arbitrary correction amount (positive or negative) which is added to the bitcoin amount. This is where you can, for example, enter total amount of the bitcoins you bought if you wish it to be included in the sum, or simply use it as a bitcoin calculator. You can specify any mining pool or exchange which has JSON API (most of them do). The only thing you need to know is URL and JSON keys. The current rate we need is in the "buy" JSON value. 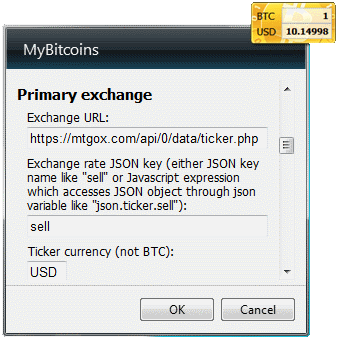 So, to configure MyBitcoins to use BTC-e, we have to enter ticker URL for "primary exchange" and JSON key "buy" as exchange rate JSON key. Additionaly, we can use "buy", "last" and "sell" for fields 1 to 3 under secondary exchange section for expanded view. Configuring gadget to use pool APIs works in the same way. The only difference is that you can configure up to two JSON keys for pools, since you're probably interested in both paid and unpaid amounts. As there is only one available rate, make sure that JSON keys for fields 1-3 are blank.